A POS system is a network that allows any type of business to conduct sales transactions with customers. The acronym POS stands for point of sale, and the term is most applicable to retail businesses that need to carry out transactions using a checkout or cash register setup. At the point of sale, a cashier or company employee notifies the customer of the total price of his or her purchase and processes transactions using a payment method such as cash, credit, or debit card. After the transaction, a receipt is typically given to the customer. Traditionally, POS systems have consisted of cash register that will calculate and record sales transactions, according to Entrepreneur. POS systems advanced enormously throughout the 20th century, but the Internet and the advent of devices such as tablets have revolutionized point-of-sale technology for many retail establishments and providers of services. What Does a POS System Do? 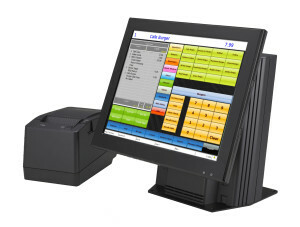 A POS system can help retail establishments carry out a variety of different functions. POS systems can help companies to not only carry out transactions, but also to analyze data that is acquired through those transactions. This type of data helps companies determine which products or services are selling the best. POS systems typically allow retailers to develop a sales history that is very useful in developing business strategies for the future. For a company, figuring out which product or service is garnering the most profits is essential to achieving success, and POS systems record data that automates this task and makes it much easier. Another advantage of a POS system is that it makes it easier to accurately price items. Typically, systems relying on POS technology will use bar-code scanners that help to guarantee the accuracy of pricing. This makes sales more accurate and trustworthy for both retailers and customers. Simplicity of Operation – Systems that are simpler to operate give companies the benefits of shorter training time and increasing convenience. The sooner a new employee can be trained on a POS system, the less money will be lost in training and new employee acquisition. Entering Sales Information – Smaller businesses might not be able to have inventory codes for every product they sell. Smaller companies might be best off if they are able to enter sales information manually. Information Updates – Companies on the market for a system that will allow them to conduct transactions need to factor in how often they will update sales information into their choice on an appropriate system. Tracking Sales – Companies need to be able to track sales if they want to capitalize on sales data. Many POS systems will automatically create sales reports that are perfect for helping companies to develop new advertising and sales strategies. Security – A system that carries out transactions will need to process sensitive information such as customer credit card numbers. Therefore, the protection of data when using systems that operate via the Cloud, for example, is an important issue. Companies need to put a great deal of thought and research into finding the right POS system to maximize their earning potentials.